Markets traded both sides of unchanged last night here in Chicago. KC wheat leads the way lower (off 5 cents), beans higher (up 2) while corn is just below unchanged. Cotton futures are back below 67 cents but up from Friday’s close. The US Dollar is down again in the overnight as there is some smoke coming out of Japan regarding future economic leadership. The USD index is trading at 9 month lows this morning, which should support grain prices this week if trends continue. For the week ahead, we have expiration for serial August CBOT options, NOPA Crush (today), Cattle on Feed (Friday) and central bank talk coming from Japan and Europe (Wed/Thurs). USDA data flow will be slow, outside of the normal grain reports. Below is the 10 day precip outlook. If it is correct, NW Iowa should be in decent shape in two weeks. If this is wrong, I think markets get nervous fast. Corn futures are trading with forecasts in flux keeping the Northern Hemisphere crop expectations on the move. Pollination is well underway now, with most of the crop exposed to this critical period over the next two weeks. Forecasts have moderated from where they were a few weeks back, but lack of precip and high temperatures remain a theme in the NW corn belt. Crop conditions should fall a couple of percentage points tonight. Heat will accompany limited rainfall in areas around and between Des Moines, Omaha, Kansas City over the next week and a half. I expect crop stress will be the talk on the wires inspiring a further fall in US crop condition ratings. 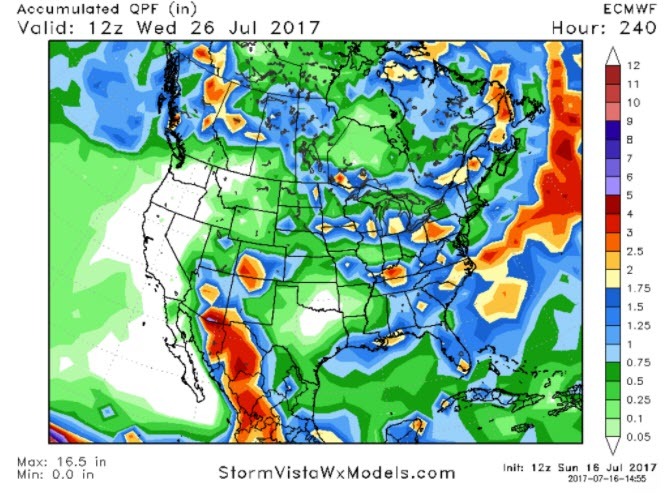 Unfortunately, there is no evidence of any meaningful rain for the N Plains to help end/reduce the drought in the Dakotas. I expect prices to make another run back above 4.00 in the coming weeks. COT reports did show a shift to a long position in corn, but keep in mind that was as of last Tuesday’s close, prices are down 30 cents since then. That said, I do worry about the fund length right now as a limiter to upside. The outright long, short and net positions were at extreme levels compared to the last six months. I would look to pay up and roll the 390-400 corn calls we own, by Friday. Wheat futures are everywhere the morning depending on the crop you follow. KC wheat futures are down a few cents, Chicago Wheat is unchanged, while Minny wheat is on the move higher. Wheat futures are back to being the whipping post of the CBOT after a few weeks of leadership. Nothing has changed in Minneapolis wheat, which has me inclined to believe the entire complex will rebound but it I imagine we make a quick test of 5.00 first. There should be good support there. Winter wheat is at the point where finding bullish news could become problematic, markets are 1.00 higher than a year ago and it will be up to the Minneapolis news flow keeping prices afloat. Ending stocks in HRS should fall another 30-50 million bushels (right now at 120 million bu) in coming reports which should be supportive. There is still a lot more demand to ration. I like being long March-Short May futures. Other than that, look to establish 2018 wheat hedges on rallies back to near recent highs. Soybeans had a wild ride last week, I expect the same to happen this week. The 10.00 put/call combo is going for 20 cents expiring on Friday. COT reports climbed above “0” last week with a massive shift in fund positions, but I imagine we are back below that level given the sell off since Tuesday. I do not believe the soybean party is over yet, given the late crop and the August time frame ahead. Nov beans tend to do well in August with 5,15 and 30 year seasonals all pointing higher. We expect crop conditions to deteriorate 2 % tonight. NOPA crush reports are out today, which could provide some trading winds but the forecast is much more important. As of right now I see little that has changed in the western growing regions. Out east in these parts things look fantastic, they will need to be very good to make up for the dryland losses out West. Cotton markets are losing spec longs on a weekly basis now. The outright long position is at levels not seen since Spring of 2016. The net spec position has paired itself in half, while new specs have come into the market over recent weeks. Texas crop ratings returned to the good last week, if that would happen again I think we could see more bloodshed on the charts this week. The 66 cent price gap on December is still open, I look for prices to come back to that level before proceeding higher. The 6-10 forecast shows some problems ahead, but nothing to get too worried about yet. Exchange cotton stocks are down, which I think is something to keep in mind when selling here. I have a hard time seeing a rally back above 70 cents, if given the chance roll hedges back up. At this point I am content being hedged near the money in short term options.